Polls apart, a new joint study by Number Cruncher Politics and Populus of EU referendum polling, has resolved the mystery of why phone and online polls have been producing such different results. It concludes that there are two principal causes for the discrepancy between phone polls and online polls of the question of the UK’s membership of the European Union. About a third of the gap can be explained by the different ways in which the two modes typically deal with undecided voters. However the analysis finds that the bulk of the discrepancy is due simply to internet and phone polls sampling different people. It also uncovers a third dimension to political polling accuracy. Polls have always used quotas or weights for demographics, and following 1992 more attention was paid to the partisan composition of samples. It now appears that social attitudes also need to be accounted for, and it is this that helps resolve the phone-online puzzle. *The online question in March used the revised question presentation, which displays the “don’t know” option much less prominently. The report can be viewed or downloaded via this link. 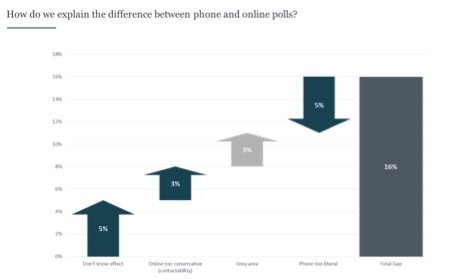 The Polls apart study interviewed 1,002 GB adults (phone) and 2,071 GB adults (online) between 26th and 28th February, 1,004 GB adults between 4th and 6th March (phone) and 4,047 GB adults between 2nd and 10th March (online). Data were weighted by 2015 general election vote, age, gender, region, socioeconomic grade, housing tenure, employment status, car ownership and whether the respondent had taken a foreign holiday in the last three years. Where indicated, data were additionally weighted by attitudes to gender equality, racial equality and (for respondents in England) national identity. Populus is a member of the British Polling Council and abides by its rules.